Fantastic eaten any time of year, this sticky, syrupy sponge definitely deserves its high ranking. The citrus keeps the cake from becoming too sweet. 1. Preheat the oven to 180°C, gas mark 4. Grease and line a 900g loaf tin with baking parchment. In a bowl, use electric beaters to cream together the butter and caster sugar for 3-4 minutes until fluffy and very pale. Beat in the eggs, then sift in the flour and mix well to combine. Stir in the milk and lemon zest. 2. Spoon the mixture into the prepared loaf tin and bake for about 45 minutes until a skewer inserted into the centre of the cake comes out clean. 3. Ten minutes before the cake is cooked through, heat the lemon juice and granulated sugar in a pan until the sugar has dissolved; set aside. 4. Remove the cake from the oven and, while still hot and in its tin, prick the surface all over with a skewer. 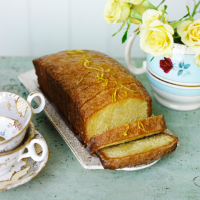 Drizzle over the hot lemon syrup, then leave the cake to cool completely in the tin before cutting into thick slices to serve. Garnish with extra lemon zest, if liked.